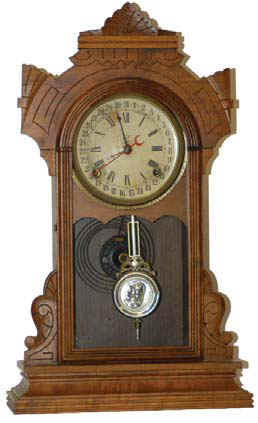 Waterbury Clock Co. walnut parlor-calendar clock "Andover", ca 1886. Like all the preceding gingerbread clocks this one is clean and running. There is a calendar with this clock, 8 day movement, half hour strike, and running great. Dial is original, silver dial ring and pendulum both original. On the back is almost a full label but is so dark I can't read it. Maybe in the bright sunlight. Now the bad; the glass has no designs and it should; 2 little angle pieces missing on the top. Would certainly pass most folks inspection if you didn't have a catalog to see what the original should look like. Ly-Waterbury #1679. $250- $350.